Our agents are not just dedicated to getting you a great value on a magical vacation, but we are also fans and frequent visitors of Disney resorts. Our firsthand knowledge of the parks, resorts and restaurants, and our experiences vacationing there with our own families, gives us great insight and ideas for making recommendations to you. Our additional training as Disney Travel Agents gives us the tools, access and information to assist you in planning a vacation you'll never forget! All of our travel consultants are College of Disney Knowledge graduates. My name is Kristen and I am the owner of Closer to the Magic Vacations! I have loved Walt Disney World since I was a small child on my first trip with my grandparents! My love for the Disney parks and brand grew as I got older and watched my cousins and now my children experience Disney magic! I personally have planned over 500 family trips to the Walt Disney World Resort and can help make all your family's vacation dreams come true! I offer customized touring plans, concierge level service and an experience you won't forget! I look forward to bringing you closer to the magic of Disney! It all began when my parents took me to Walt Disney World to celebrate my 5th birthday. I can still remember sitting in the beautiful Contemporary Hotel restaurant and a group of handsome waiters presented me with my very own Mickey Mouse cake and sang Happy Birthday. They made such a big deal of everything. It was truly magical! Since then, I’ve been hooked on Disney! Over the years, I’ve been back to see Mickey and Minnie many times and each time I still feel the same excitement I did when I was five years old. After having a rewarding career that including being a Press Secretary for a Congressman, managing grassroots operations for a large trade association, and owning my own business, I decided that I wanted to do something that I truly LOVED! Years ago, when I was planning our first Walt Disney World trip for our children, I enjoyed every aspect of the planning process and loved learning everything about WDW…and now I can do that for your family! Walt Disney World truly is a magical place, but when you are planning your first trip (or even your 10th trip), it’s easy to get overwhelmed with all of the amazing options, resorts and restaurants. Things are always changing at WDW. That’s where I come in! Through my personal experiences and my extensive training from the “College of Disney Knowledge,” I can determine which hotel is right for your budget and vacation style, which restaurants your kids will love and organize any tours or extras. I offer itinerary planning, dining reservations, tee times, spa appointments and Special Event Tickets like Mickey's Not So Scary Halloween Party or Mickey's Very Merry Christmas Party. Let me do the legwork for you! Also, did you know that there is more to Disney travel than going to Walt Disney World in Orlando? Disney offers a vast array of vacations options such as Disney cruises, a spectacularly themed resort in Hawaii and even guided tours around the world! All Disney vacations focus on fun and bringing families together. I would love to tell you more about each of these exciting travel ideas. Let me do the research and make all the calls for you. Plus, my services are TOTALLY FREE! Please select my name on the quote form and let me use my expertise and planning skills to put together the perfect Disney vacation for you and your family. Hi, I’m Laurie! I am so excited to help you plan your vacation to your Disney destination! My love for Disney parks began when I was 4 years old with our first family trip to visit Mickey. Even though we did not visit again until I was 16 years old, that love stayed with me. At the age of 16, I was lucky enough to enjoy the honor of parading down Main Street as part of the visiting Mardi Gras Krewe. The feeling you get standing on one of those floats and seeing the castle is not one I can easily describe. At that point I was officially a Disney Nut! We continued to visit Disney every few years until I met my husband. My husband and I married in 2001 and have made several visits of our own since then. I was lucky enough to introduce him to Disney and he loves it as much as I do. We have since made yearly visits with our 3 children, most recently this past December. To date, I have made 13 trips (and still counting!) to the Walt Disney World Resort. I have stayed at and visited several of the Walt Disney World resorts and dined at a multitude of their restaurants. I have traveled with and without children (just my husband and I), grandparents, as well as in a large group. I have helped several of my friends and my family members plan their own magical experiences to Walt Disney World. As your agent, I will help you plan your Disney vacation for any budget from start to finish, by planning your vacation package, dining, special events and itinerary. I am here to make your Disney vacation a dream come true for you and your family. I can’t wait to help you create your own family memories to cherish! With my tricks and tips from my Disney experiences, I will help to make your Disney vacation a most memorable and magical one. Let’s get started! Hello! I am Angelle Griffin. I am a happily married mom of 3 boys ages 7,5, and 2. As long as I can remember my life has included Disney. This includes a variety of different trips. This includes childhood tips, celebrating Senior year trip, celebrating my honeymoon , and 4 trips as a parent with our boys. I truly believe there is no better place to be than a Disney destination! The Magic you feel is something only you can describe once you have been! I've experienced the joys at different phases of life and loved each one! I believe Disney is great for ALL ages! You are never to young or old! I've taken my boys before they were 1. My favorite thing about Disney is dining! My husband and I will plan our days around what's next to eat! Looking forward to helping you and your loved ones plan a truly Magical Disney experience from beginning to end! Hi! My name is Carrie Stone. I am a wife and mother to my very own princess from South Carolina. Our family has been traveling to Walt Disney World for over 15 years. The first time my husband and I visited the Walt Disney World Resort we were a young couple. And over time our trips evolved into family vacations with our daughter starting when she was an infant on up to her present day tween status. We have experienced the agony and the ecstasy of Walt Disney World over Spring Break and 4th of July. We have celebrated Birthdays with Mickey Cupcakes, enjoyed our Thanksgiving meal at Chef Mickey's and toasted our Wedding Anniversary watching the sun set from the California Grill. I specialize in vacations to the Walt Disney World resort but as a graduate of Disney's College of Knowledge, I am able to assist you in planning your vacations at any of the Disney Properties, Cruises or Tours. My experience and training can help take the stress out of planning your vacation. I will share my park touring tips and strategies that will help make your trip even more magical. I offer personal services which include itinerary planning and dining reservations. I can also book everything from tee times, spa appointments and Special Event Tickets like Mickey's Not So Scary Halloween Party or Mickey's Very Merry Christmas Party. I can help answer any questions you have and plan a vacation of a lifetime for you and your family. My passion for Disney and travel, attention to detail and personal experiences will enable me to help you have the most magical Disney vacation you can possibly dream of. I traveled to Walt Disney World over 150 times as a child with my family and later with my daughter as my daughter was growing up. It's their favorite place to be on vacation for a week or just a day. I am lucky enough to live in Fort Lauderdale for the past 21 years, so Disney is only a 3 hour drive away. My goal is to make sure you have the best vacation ever filled with great memories. Jen started her Disney dreams fascination when she was selected for the Disney College Program at Walt Disney World in Orlando, Florida. She spent an entire summer wandering the park, getting an education of a lifetime, and learning the ropes of the happiest place on earth. 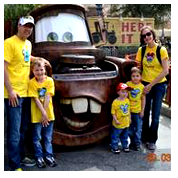 Once Jen became a military wife and had two beautiful children, she began to share this love of Disney with her family. Duty stations such as Quantico, Virginia; Jacksonville, North Carolina; and Pensacola, Florida where never too far away from the magic. Now, a move to San Diego will get her closer to the full Disney experience. Jen would love to share her expertise and experiences to make your family smile! Give her your dreams, she'll ensure you experience the happiness. Hi there, I'm Kristi. I'm a mom to four great kids, wife of a police officer and a Disney fanatic! I visited Disney World for the first time when I was 10 and was hooked, I think they put something in those Mickey ice cream bars! I've been several times since then and have experienced something new and exciting on each trip. I would love to help you plan your trip to one of the many Disney destinations and experience something magical too. Hello, I am Vicki a mother to 3 growing children and a wife to a wonderful man who has helped feed my love of Disney. I made my first trip to Walt Disney World when I was not quite 2 and made several other trips with my family over the years. When I started my own family I knew I would share my love of Disney with them! I had the pleasure of showing my husband Walt Disney World for the first time. We now both share our love of Disney with our children. We go on yearly Christmas trips to Walt Disney World with our children and we take a yearly adult only trip as well. We became Disney Vacation Club members in 2008 and continue to enjoy all the different resorts Walt Disney World has to offer. We love to experience the different dining options that Disney offers and we are working our way down the list of restaurants, whether its a Quick Service, Table Service, or Signature we will try them all. I am here to help plan your perfect Disney vacation. I can not wait to get started making all your families Disney dreams come true. Hi! My name is Melissa and I love sharing my passion and knowledge of Disney with everyone. I have a great extent of personal experience in Disney Cruise Lines and Walt Disney World Resorts. We have celebrated holidays , birthdays, anniversaries, and everything in between at the most magical place on earth, Walt Disney World Resort! I achieve a great deal of personal satisfaction when I can help families, couples, individuals, or groups experience the magic my family feels every time we are in our home away from home. The food, parades, fireworks, attractions, resorts, are top notch. The magic you feel is incomparable to anything else. I am happily married for the past 18 years. We have two children ages 14 and 9. Our family has experienced Walt Disney World and Disney Cruise Lines with infants, toddlers, young children and now a teenager. We’ve even snuck away for an adults only Disney Cruise. Every experience is the best. There is no right age to experience the magic of Disney, so why wait? Let me help you experience the magic like my family has gotten to enjoy for all these years. I will be with you every step of the way! Hello! My name is Liz. I am a wife and mother to two little boys, ages 3 and 1. I have had the opportunity to experience multiple Disney vacations both as a child and now as a parent. As a child I had the opportunity to vacation at Disneyland, Disney World, Disneyland Paris, and even experience a Disney Cruise. I was fortunate enough to have had the opportunity to perform as a dancer at Disney World during Disney Magic Music Days while in high school. These experiences instilled a love for Disney that I now share with my entire family. I truly believe that no matter what age, the experience a family can have at Disney is second to none. My oldest son has already experienced the magic of Disney three times! I have planned for my immediate family as well as my extended family. I absolutely love to create Disney vacations. Having the ability to harmonize the resort, the dining, the park experiences is fantastic. Seeing it all come together into memories that will last forever is truly amazing. I look forward to the opportunity to craft a Disney experience for you and your family that you will remember for years to come!